I have just returned back to the country after having a couple of days in the city. The main thing I notice when I get back to Daylesford is just how quiet it is and the amazing show the stars put on when there is no cloud cover. I have had guests every weekend, so I am now quite comfortable getting breakfasts and doing all I have to do. The guests I have had have all been really nice and all comment on just how beautiful "Old Chilli B&B" is. I must say I agree with them, even though it was only built in 2001 it has been designed with lots of older features and there is lots of antique furniture, so you get the feeling it has been here for a lot more than 10 years. I did have two wonderful days in Eltham looking after our new little angel Clare. She is a very good little lady and at almost 6 weeks she is starting to focus on your face. 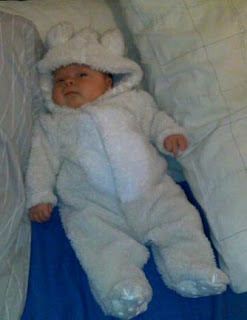 Here is a photo of her in her little bunny suit. Sweet, precious and adorable little bunny! I'm glad to hear that you're enjoying the B&B, there's nothing like the country.. well unless you're on vacation in the mountains! ;-) Enjoy your day Davine. She is so very pretty! !